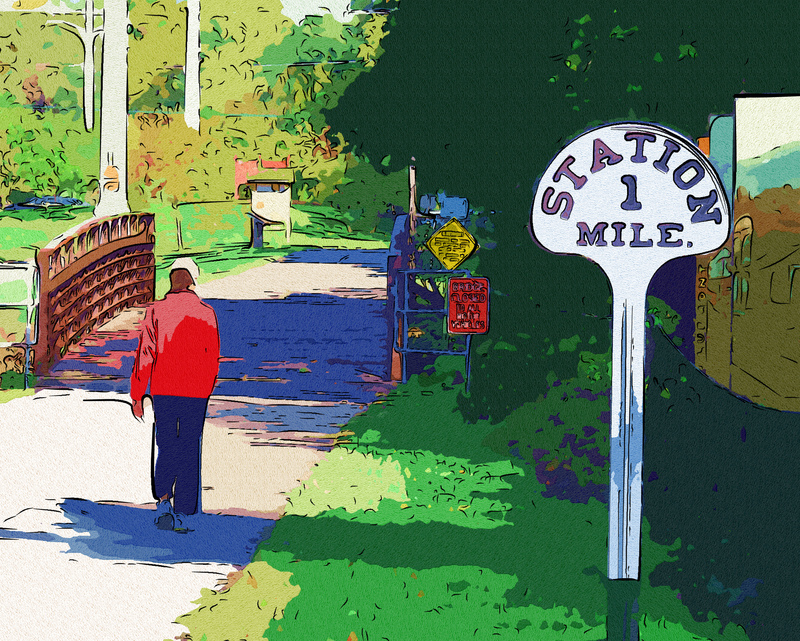 Over the past two months, my family and I have been busy settling into our new house in Arlington, Virginia, and in my spare time I’ve been making digital paintings of nearby hiking trails, parks, shopping areas and houses. It has been a lot of fun getting out to take these photos that I then turn into paintings on the computer. Tonight was the first night that I exhibited the images. A boutique shopping night was sponsored by MONA — Moms of North Arlington, a group of mostly women (and some Dads, including moi!) who pool references on everything from who’s a good doctor to where to buy a new crib. They also have a listserve for folks to sell stuff. Around 5 p.m., I packed up our tiny car and headed over to the Knights of Columbus, where the affair was being held. Attendants were treated to great desserts — I did sample one delicious chocolate chip cookie — and drinks, and then were free to stroll around and shop at more than 30 vendors who had come in to offer their wares, selling everything from fine chocolates to hair ties. Here are some shots of the nearby Westover Village that I took and reimaged as paintings. This shot was taken right behind the 7/11 at the corner of — gosh, I can’t remember the intersection of streets here but maybe someone will recognize it and let me know. 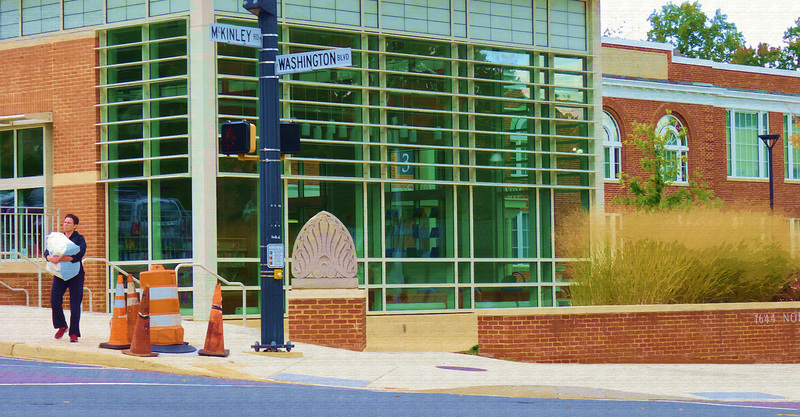 Then, I headed over towards the main shopping strip of Westover Village and took a few shots of the library. 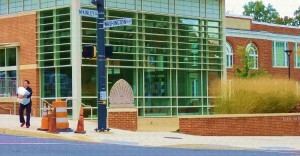 I decided to crop the image as a horizontal piece to emphasize the lovely grasses in front of the building. It’s late now and I need some sleep but here’s one more shot of the nearby W & O D trail that runs right by our house. I have spent many mornings out cycling here. It runs parallel to a stream bed and crosses it off and on — that is, especially if you cross over to Four Mile Run. 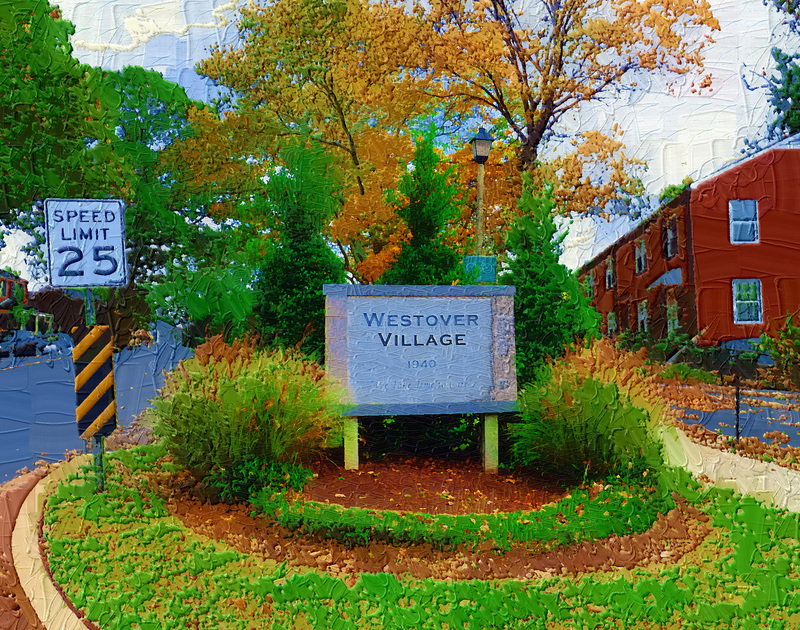 Stay tuned for more shots of Westover Village, the W & O D Trail, and Dominion Hills. It was great meeting everyone tonight — especially my new neighbors! It is sooo nice to see you sharing your talents with your new community. More shots of the library please. I know they miss you at HPPL. Arlington is lucky to have you and your family. I will enjoy following your new adventure through your beautiful art and writing. Bring your family to Maine this summer. I have new kids for you to inspire! Thanks so much — good to hear from you, Michelle. I only wish we could come north this summer to Maine. That would be fantastic. Well, maybe one day as we do love that part of the country. Hope you’re liking it up there!